Holtwood Methodist Church is the home church of Brian and Laureen Powell, who are Missionaries in Singapore with OMF International (originally called China Inland Mission). Brian has an engineering degree and Laureen a pharmacy degree. From 1993 to 2007, Brian and (from 1998) Laureen were based in Matol a village inland from Davao City on the island of Mindanao in the Southern Philippines. There they worked with a minority people group called the Langilan Manobo. Some of their time was spent on translating portions of the Old Testament into the Manobo language. They were also involved in teaching and training in the churches of the area, and in some primary healthcare work. From 2008 to mid-2011 Brian & Laureen lived on the small island of Camiguin (near the North coast of Mindanao). There, they worked alongside the existing small churches of various denominations to help them to work together to communicate the gospel message of salvation through Jesus Christ. 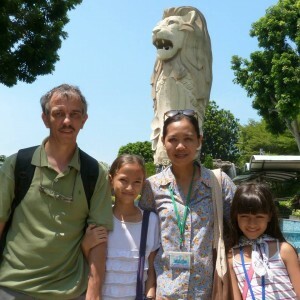 In August 2012 Brian and Laureen returned to the Philippines following a year in the UK . Whilst here, they stayed in Derbyshire and visited many churches and prayer groups around the country, telling about their work. They returned to Davao City where they focused on translation work again, producing resource materials in the Cebuano language, especially for pastors and church leaders including translating “Pilgrim’s Progress into Cebuano. They also served as team leaders for OMF’s work amongst the Manobo at that time. More recently they have moved to OMF headquarters in Singapore where they run the Orientation Courses for new OMF recruits who will be stationed all over East Asia. Brian & Laureen and the girls are on Home Assignment in the UK for a year at present, until July 2018, when they are due to return to Singapore.